If america was a wheel, Washington was the hub at which all the departments of state connected as brilliant spokes and turned as one. Just like Lucius Quinctius Cincinnatus did when he gave Rome back to the people, Washington gave America back to the people. In fact some people called him “the Cincinnatus” because of this amazing feat. He emphasized that he was “no longer a public man” and that he wanted to “spend the remainder of his days in the practice of domestic virtues”. And I’m sure he meant it, but he couldn’t have been more wrong... No longer a public man? Please...He was a freaking celebrity! Everyone wanted to come to Mount Vernon and meet the man who defeated the most powerful Navy in the world. A living legend. On the other hand he kind of HAD to go back home. His plantation was pretty much bankrupt—I think eight years of neglect would do that to any business. But who could blame him? After all (if you recall from the previous post), he was a little busy fighting the British. Either way, he came back, and started reconstructing his little empire. But it wasn’t easy. Terrible winters hit once again, the American currency was severely devalued, and his land tenants in Ohio hadn’t paid rent for years! He had a lot of work to do. And to make matters worse, he was constantly getting distracted by annoying visitors who would stay for several days. He also had to adopt three kids from dead relatives. It was a mess! But as you would expect, slowly but surely Washington started making things right again. With his incredible discipline, excellent vision and judgement, he made a ton advances in agricultural matters. Bringing the farm back to life. He also became super obsessed about the navigability of the Potomac—he wouldn’t shut up about it—he saw this river as a highway to the Ohio country and a gateway to westward expansion. As usual, he was thinking beyond what most people saw. All and all, in less than five years, he went back to being the great magnate he was before the Revolution. And just like before the Revolution, he occasionally took sneak‑peeks at the political world. He just couldn’t help himself, after all he had given birth to baby America and just like any father, he wanted his baby to grow into a healthy child! Unfortunately after four or five years of being born, it became apparent that baby America was not going to make it unless her upbringing was seriously modified. This “upbringing” was (at that moment) dictated by the Articles of Confederation1, and people slowly but surely realized that these articles were not working—there was a smell of rebellion in the air2. But the smarter ones knew rebellion was not going to get them anywhere, instead, ideas about revisiting the Articles of Confederation started being brought up. Some people like Washington and Hamilton thought they needed a strong and centralized power, while others like Madison and Jefferson didn’t want a centralized power at all—they thought it would lead to monarchy again, and they hated monarchy! (obviously). Now, these three characters are very important from here on. 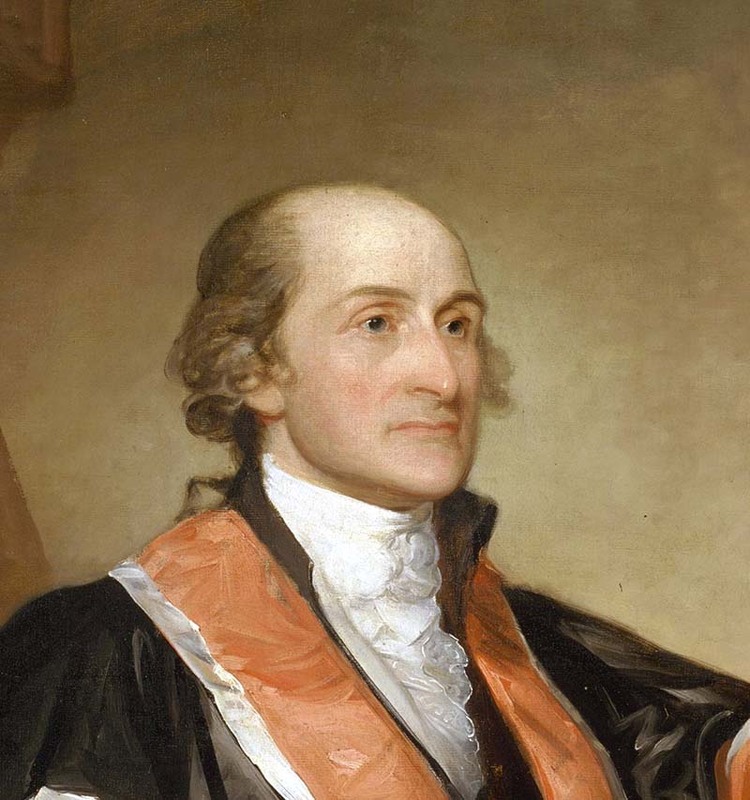 Alexander Hamilton, Thomas Jefferson, and James Madison, so let’s get familiar with them. You all remember Hamilton right? One of my favorites! Young and energetic, he was the soldier who shot a cannonball at the head of a statue of King George II after the Trenton and Princeton victories. He had know Washington for years, fought beside him, and was well aware of his temper—but most importantly knew how to work with him. Out of these three, Hamilton was probably the one who agreed with Washington’s ideas the most. A ten dollar bill showing Alexander Hamilton’s portrait based on an 1805 portrait by John Trumbull. Then we have Jefferson. Another plantation owner just like Washington, and about a decade younger. Brilliant guy! Very educated and a very prolific writer. He is said to be the author of the constitution3. A solid, and integral guy. 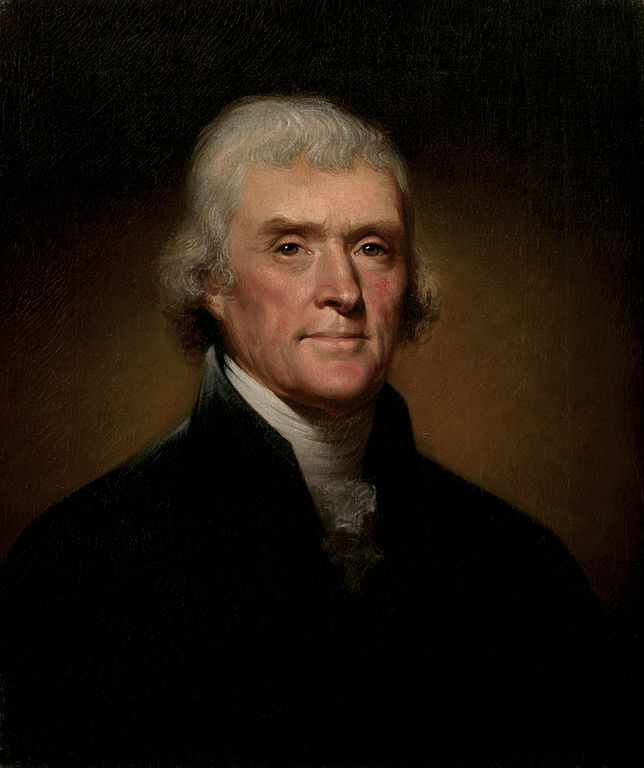 Very cautious of his actions (unlike Hamilton), and probably the most populist of all the founding fathers4. Ok, now we can come back to the story. We were talking about the Articles of Confederation and how they needed to be revisited, right? Well it was Hamilton who set the date to get together and “review” the articles. He set it around May 1787. This is five years after the recognition independence. Five years in which Washington was trying to put Mount Vernon back together piece by piece, while the country was collapsing over its own weight. Everyone feared a second Revolution—which would pretty much end up in civil war. Because of this imminent threat to the integrity of the colonies, almost everyone agreed that changes had to be done, but the question is, where? and how? Some people had fears about a centralized government because it could roll everything back into monarchy. Others feared having too much of a congressional power because there wouldn’t be unity and patriotism, besides nothing would ever get done. It was hard... Let’s keep in mind that this is a time where all they knew was monarchy, but they hated it! They had to come up with something new! To make the task even harder, they they didn’t have any other countries to look up to and say “hmm let’s try what they have” No, they were the first ones facing this problem. And THAT is what makes the American Revolution so much more impressive than any of the revolutions that came after that. All the revolutions that happened after this one were looking at George Washington as their hero, their role model. And looked at the United States as a mold. Even the French Revolution is thought to be modelled after the American Revolution but unfortunately it involved a much more blood‑thirsty crowd7. 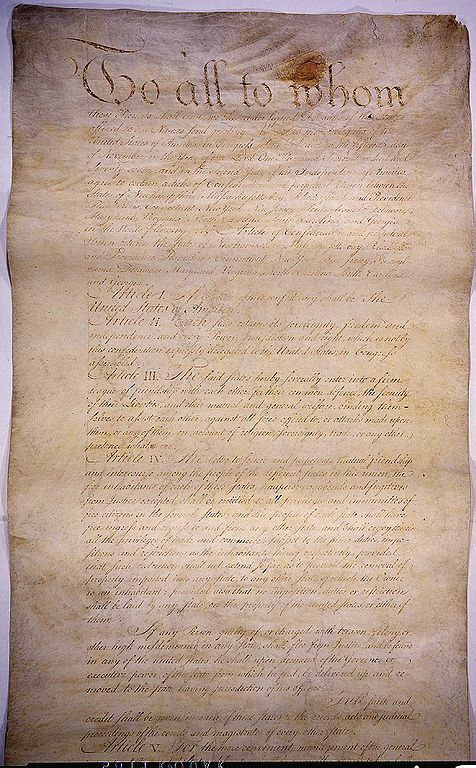 That letter from Jay was in fact a letter to persuade Washington into joining the meeting to reform the Articles of Confederation, to be held next May. But Washington declined, he just wanted to be a farmer. Hamilton, Madison, Jay, and a bunch others, kept sending him letters, begging him to join—they knew that without him the meeting would not coalesce. On that note, Washington agreed, and the meeting kicked off on May 25th 1787. They forced Washington to sit up in the high chair and act as “the president of the meeting”9. Which he hated of course, because every time he was put on the spot (by someone else) he would resort to silence and pouty faces. But it was only logical for him to be the moderator, everyone loved and respected him for what he had done, and nobody inspired more veneration than he did. 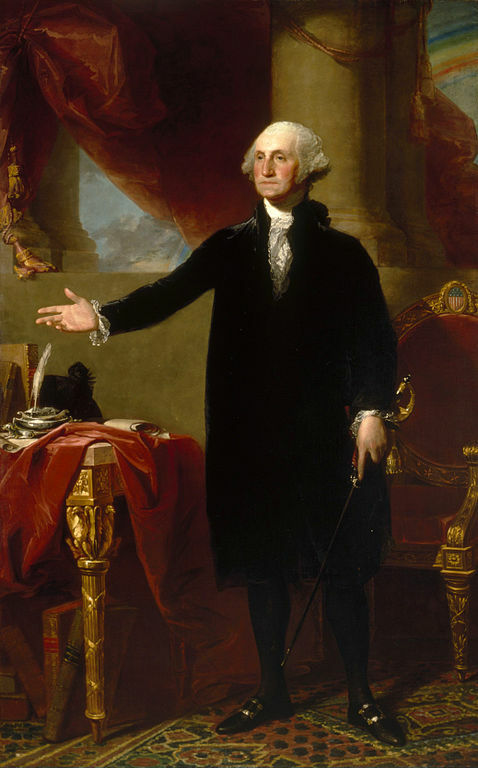 I can almost picture it, people constantly saying something and immediately looking up to see if Washington frowned or smiled—trying to get his approval. But he never smiled, so they would either get the evil eye or the death stare (and I don’t know which one is better!). 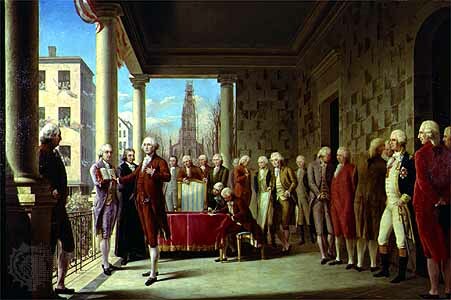 Scene at the Signing of the Constitution of the United States. A portrait by Gilbert Stuart. Washington seems to be extending his hand to someone. Which is funny, because George Washington didn’t shake anybody’s hand. 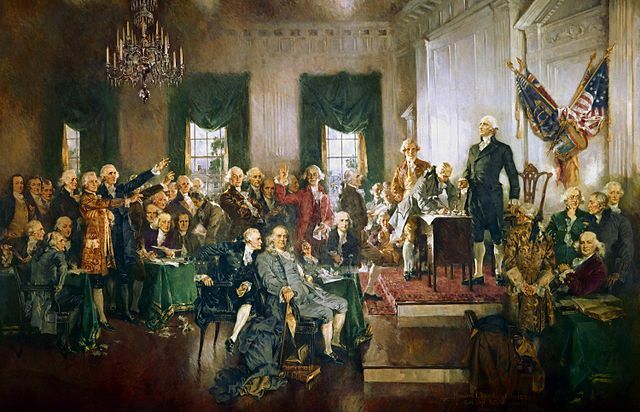 It took this group of exemplary individuals about four months to transform the Articles of Confederation into a brand new document called “The Constitution”. They built up on Jay’s idea of the three branches, trying to touch all subjects—except slavery, that subject was avoided like a plague. But in the end, they came to an agreement. It was definitely not a perfect document but they thought it would do for the time being. One of the main sections of the constitution established that there would be a president for this new nation, and Washington came back to Mount Vernon that September almost sure he would end up being the president (as much as it scared him). He kept acting like he didn’t want it, and he probably didn’t, but there was no one else. Franklin12 was too old, and Adams13 was just not there yet. 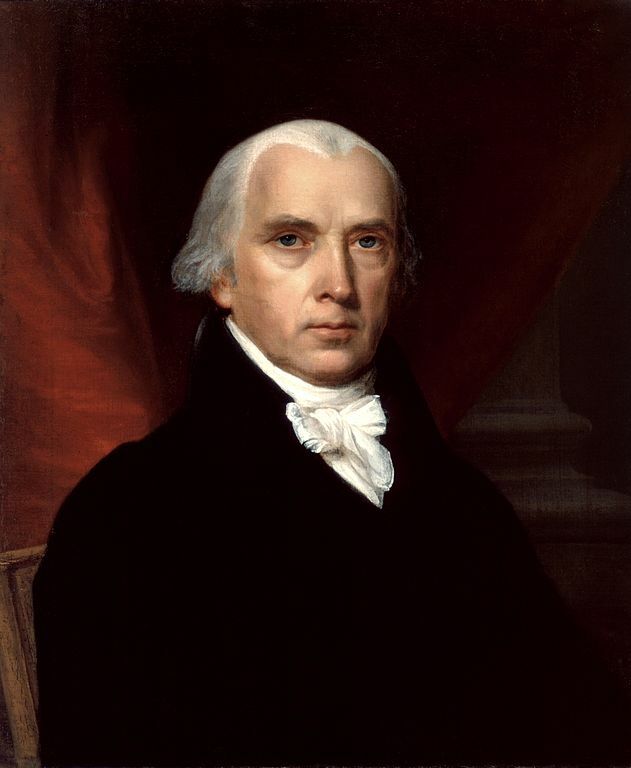 The elections didn’t take place until two years later, because the Constitution had to be ratified (accepted) by all states which took about a year14—followed by another year of just messing around and begging Washington to sign‑up as a candidate. It wasn’t until 1789 that the elections took place in New York. To put it slightly in perspective, this is eight years after the war was over… it had been a while. Washington won unanimously that April, and the news united the country like never before. People knew he was the only man who could save the country a second time. Oil painting of George Washington’s inauguration as the first President of the United States. It’s funny that this bible he is putting his hands on, was a last‑minute thing. Because in an attempt to make his inauguration seem more majestic, someone thought about using a bible to swear over. A simple act that (even today) makes people have a hard time separating church and state.